Recently, I had the pleasure to be zoomed into a NC Orff Level 3 class taught by the amazing Maribeth Yoder-White. She asked me to showcase some of technology tools used to integrate into an elementary music classroom. I showed tools that could assist with Orff ensembles (Tim Purdum’s Orff xylophone app), recorders (Staff Wars and Staff Wars Live), flipping the classroom (Explain Everything), creating music (Incredibox, Noteflight, SoundTrap), and digital student portfolios (Seesaw). Her students asked very thought-provoking questions. 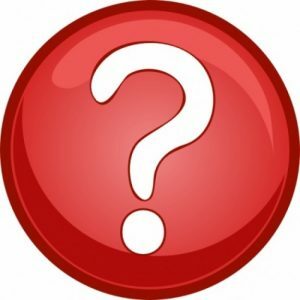 Some of the questions I share here as a FAQ for integrating technology into the elementary music classroom. When students have so much screen time, how does a music educator balance the technology usage in the classroom? This question is excellent and is asked often. 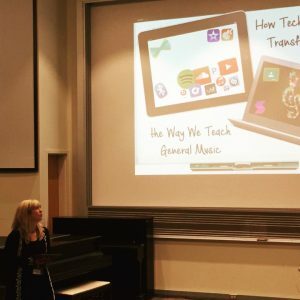 When I was performing research for a keynote address I gave recently titled, “How Technology is Transforming the Way We Teach Elementary General Music Classes”, I directly addressed this question. When reading numerous Facebook music education boards, there is a divide on this topic. Music educators will comment on how technology can enhance certain activities like composition and music making for those who have limited abilities. Others will state that their music classroom is a “screen free” zone because students need a break from screens. While others are expected to utilize technology to address 21st century skills or their schools have become 1:1 (one device per student). My answer to this question is that technology should be used when it is the best tool to use. Some examples that I have used in my elementary music classroom are for composition, recording an Orff arrangement, creating their own digital composition ebooks, creating a movie trailer about a composer, performing a virtual and acoustic orff ensemble so that every child in the classroom can successfully perform on an instrument, flipping the recorder classroom, assessing reading and performing notes on the staff, and so much more. However, when we read articles about how screen time is hurting our young children, it makes us worry and question why we should use technology. When I read those articles and books, some examples are Dr. Sue Palmer’s article “The iPad is a Far Bigger Threat to Our Children Than Anyone Realizes” and Dr. Catherine Steiner-Adaire’s book The Big Disconnect, it strikes me that there is a common theme besides the consequences of too much technology, but the concerns of educating parents on how to balance technology at home. The technology referenced are usually ones that do not have educational value. This differs from using noteflight to assist your younger students with composition. I believe that these books and articles are ones that we should not ignore and also ones that we should look at the context and the target audience. 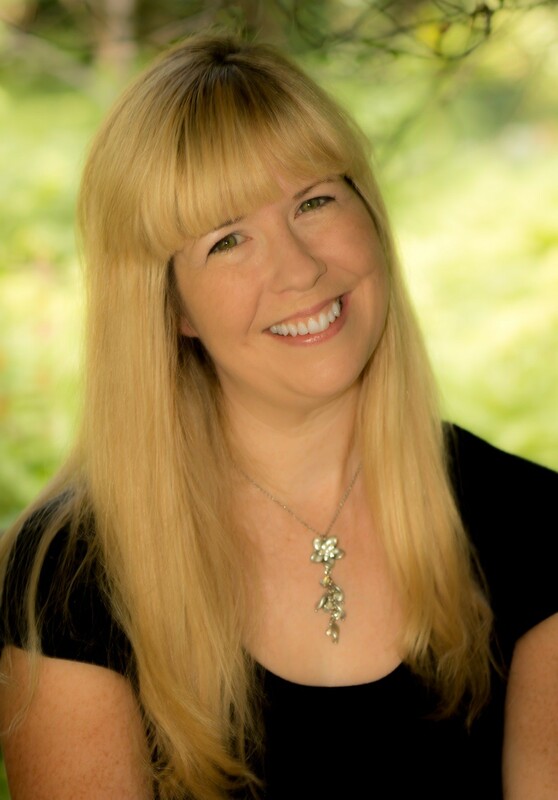 I always state in my classes and workshops that I am an elementary music educator. My students perform, play instruments, move to music, learn to read music to the best of their abilities, learn about composers, and more. Technology is a tool that I use to enhance some of that, but it is not a tool that I use everyday. I feel technology can be well associated with Dr. Ruben Puentedura’s SAMR model: Substitution, Augmentation, Modification, and Redefinition. Technology can be used simply to substitute paper and pencil assessments with google forms or Kahoot!. It can also be used throughout the SAMR process to redefine a unit in my music classroom, like a unit that involves Project-Based Learning. Basically, you can leave technology out of the music classroom; however, you could be leaving out a way to relate, connect, and hook your students. If technology could assist you with helping your students to learn music, wouldn’t it be worth it to try to integrate it? Can students use Incredibox.com/bitesizebeats.com (or the Incredibox iOS app) for more than just creating fun music? Record a musical creation in an ABA form by starting with 7 beatboxers for the A section, muting and soloing some for the B sections, and then having them all perform again for the A section. My students have written a respect rap at the beginning of the year. 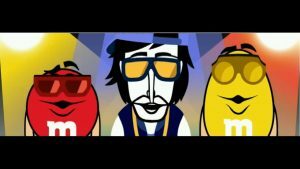 They use Incredibox to create a background beat for their rap. They perform their rap and I film them and add it to their digital student portfolios for their parents to see. On the first day of school, I say a name chant with the students to learn their names. We then add body percussion to keep the beat. We perform it one more time with Incredibox where the students and I create a background beat together. This is always a great hit! Seesaw is a free digital student portfolio (web.seesaw.me). With the classroom app, teachers and students can display their own work. In my elementary music classroom, students have displayed their musical creations, videos of their orff arrangements, audio recordings of their singing, rhythm drawings and recordings, excerpts from their upcoming concerts, compositions, recorder stars that they earned on their recorder belts, and so much more. On the Seesaw family app, the parent/guardian receives a notification when their child or teacher adds something to the journal. The parents can only see their child’s portfolio. As a parent, I receive my daughters’ works from math problem-solving to musical performances. I also receive notices of upcoming events. The platform looks a lot like many social media platforms, so many parents feel very comfortable using Seesaw. Seesaw is free for up to 10 classes, but you could substitute “classes” for grade levels. The free version also allows two teachers per class. It works on multiple platforms from iOS to android to chromebooks. The paid versions (Seesaw Plus and Seesaw for Schools) allows the teachers to also input skill sets and private teacher notes. These are valuable for assessments. What about Class Dojo for this purpose? Class Dojo started as a behavior tracking system. 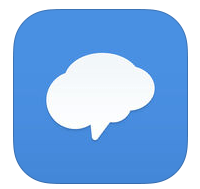 In the past couple of years, it has adopted some of the Seesaw’s student journal features. Their latest updates will allow items such as 8-minute videos. I feel that Seesaw is student-directed and Class Dojo is more teacher-directed. It really comes down to what works best for your students and what will be supported in your school. How do you use Google classroom in the elementary music classroom? 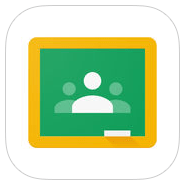 I was very lucky to have the third grade teachers use Google classroom for a blended classroom this past year. I turned to them to assist me with our spring STEAM unit. The science teacher and I created a STEAM Google classroom to have the students use to answer assessment, utilize more resources, and reflect on higher-order thinking questions. We could display safeshare videos (youtube links minus the comments and ads), google forms, questions, and assignments. It worked very well and I am excited about using it more this year. Do you use the Remind app? I do not use this personally because I can use Seesaw to send home notifications and announcements. The Remind app is wonderful for my friends who need to contact their parents when they have the students on the road with them. They use to it to tell the parents when they are leaving and arriving. It allows them to text the parents without having to use their cell phone number. What apps do you suggest for those who are severely disabled in your music class? This question was excellent and asked often. In my classroom, I do not have students severely disabled. However, when I attended the Alan November BLC conference last year, there was an app that was shown that assisted severely autistic children to communicate effectively. My answer to this teacher was to ask the student’s aide what they are using technology-wise with the student in order for them to communicate. The student’s aide works so closely with the student and can sometimes, have the best knowledge on how to assist the student in music class. How can my chromebook play Staff Wars and Staff Wars Live? Staff Wars and Staff Wars Live have been available as a free download for computers for years. Creators Craig Gonci and Marc Jacoby produced the website, themusicinteractive.com, for music educators to download programs (or some programs cost a small fee) to use in their music classrooms and on their interactive whiteboards. Staff Wars and Staff Wars V2 were two of their most popular downloads. Staff Wars is a notenameing game with a Star Wars-feel and Staff Wars V2, with the same Star Wars-feel, is a performance notenaming game where the students can play their instruments to name the notes. A couple of years ago, the Staff Wars app became available for iOS devices for .99. Soon followed was Staff Wars Live (the V2 from the website) for .99. Staff Wars can now be purchased for iOS and Google Play. During the month of July, my Lenovo chromebook was able to perform an upgrade where it allowed me to run Android Apps through Google Play in a beta atmosphere. I could now purchase Staff Wars and play it on my chromebook! If you have these type of chromebooks in your school, then you can ask IT to purchase and access Staff Wars Live for those chromebooks. Currently, Staff Wars Live (V2) is not available for Android. Is there an app that is like an Interactive Whiteboard? Yes. I believe that the most popular app that turns your device into an Interactive Whiteboard would be Explain Everything. Explain Everything is available for iOS, Chrome OS, Android, and Windows. As quoted on their website, it is “one app to explain everything.” Explain Everything can be used to draw, annotate, record, animate, interact, and so much more. I have had students draw rhythms and record themselves performing those rhythms (this can be done in Seesaw as well). However, with Explain Everything, I have the capability of flipping my classroom. I can create a video lesson where I upload a song, create a video of me playing the song, and film a “follow the bouncy ball” for the students to play along. Explain Everything has collaboration features where you can simply share your file with the students and vice versa. In an earlier post, I showed how to create this type of flipped classroom file with Explain Everything. Explain Everything also operates like an interactive whiteboard. 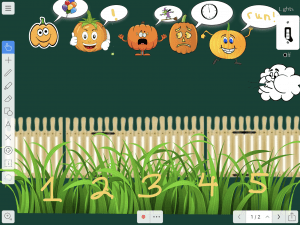 I created a “Five Little Pumpkins” file where I could lock images in place, much like an interactive whiteboard file. I also added images that could move while the students sang the song. The students can sing the song, move the objects to the proper place, and record themselves doing this. I can later access their recording and assess their singing. The pricing varies due to what you want to do. If you want to individually use Explain Everything as a teaching tool in your classroom and you are fine with no collaboration tools but you can export easily, then the $9.99 iOS app would work well for you. However, if you want to use the collaboration tools along with additional tools, and you want cross-platform abilities, then you want the subscription. The subscription pricing varies from $4.99 billed monthly to $24.99 for five users, billed annually. I felt that the students in the Orff Level 3 class asked extremely thought-provoking questions. I hope that I gave them some thoughtful answers that produced more insight on how to integrate technology into the elementary music classroom.